Betsy lost her home due to allergies. Rehoming a cat isn’t easy. We know this from personal experience. We’ve been doing it for more than 10 years. Sometimes we think the cats in our group home will never get adopted. Others find their forever families so quickly, we barely get to know them. We’ve decided it all comes down to luck. Or maybe the cat’s ability to send out “adopt me” vibes to its forever family, wherever that family happens to be. People have seen our cats online and come from other states to meet and adopt them! Adopting from us isn’t easy. We’re very careful and very picky. We’re assuming you’re reading this because you want to be careful and picky, too. So here are some tips for finding a new home for a cat safely and with the least amount of stress for both the cat and you. Charles lost his home when his family moved. Finding a new home for your cat is as much about his needs as yours. Remember, unhappiness could lead to behavior issues and even illness. Try to visualize his idea of a perfect home, and include his requirements, as well as yours, in your ads. Give yourself enough time to find a suitable home. And be patient. Finding a new home for a cat, even a kitten, can take weeks or even months. Don't declaw the cat to make him more "marketable." Cats with claws are just as adoptable as cats without, and declawing could cause many problems for the cat and his future family. If your cat is indoor/outdoor now, don’t put him in a “strictly indoor” home. He’ll be miserable, and putting an indoor/outdoor cat in a strictly indoor home often causes behavior problems. Believe it or not, there are lots of adopters looking for indoor/outdoor and even completely outdoor cats. Keep lifelong friends or litter mates together. Many people are willing and eager to adopt two cats who are friends and bonded to each other. And the cats will grieve for each other if separated, making the adjustment to a new home even more difficult and painful. Cloudy Girl's family was tired of cats. Believe it or not, some of our favorite adopters found us on the Craig’s Lists in our area. There are good adopters and bad ones everywhere. The trick is being able to tell them apart. Fliers in coffee shops, veterinarians’ offices and pet supply stores; newspaper classified sections; PetFinder.com and, yes, Craig’s List are all good ways to spread the word about your cat. If you advertise the cat online or in the newspaper, don’t mention all the possessions he comes with. You want people to be interested in the cat because of his great personality, not the free litter box, toys and food. In your ads explain why you’re giving the cat up for adoption. Describe his personality, his likes and dislikes, and the kind of home that would be perfect for him. Be honest about any behavior or medical issues. Many people are willing to adopt a senior cat or a cat with a chronic health problem, like diabetes. Your ads should also ask people to tell you a little bit about themselves and their home. Do they live in a house or an apartment? Do they have children, and if so, how many and how old? Do they have other cats or dogs? Will the cat be able to go out if he wants to? Their answers will tell you whether they might be a good match for your cat. We generally do not adopt to people who have more than two or three other animals. Jonesy lived with a hoarder. Rehoming a cat isn’t without risks. Sadly, there are people who do terrible things to cats. Screen carefully so you know your cat will be safe. 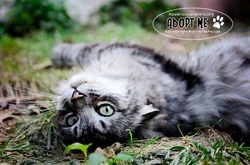 Have potential adopters come to your home to meet the cat, but deliver him to his new home yourself. If the place doesn’t look feel right, leave with the cat. Trust your cat's instincts and judgment. He'll let you know whether he’s afraid of the people and if he wants to live with them. Charge an adoption fee. This will protect the cat from being sold to a research lab or being used to train dogs to fight. Kittens are especially vulnerable. Ask for and check references. Also check with area animal control agencies. If the people have turned an animal in to a shelter, do not adopt to them, no matter how “good” the reason might have been. A few years from now, they could find a “good” reason to do the same thing to your cat! Have the adopter sign a contract. The contract should include instructions on what to do with the cat if things don't work out. Bootsey is looking for her fourth home. Saying goodbye is never easy, but try to be upbeat and positive when you deliver your cat to his new home. He’ll pick up on your thoughts and be less stressed and anxious about what’s happening to him. Be sure to take an unwashed towel or pillowcase. The familiar scents of home will be comforting to him. Also take his dishes. Cats in strange surroundings eat better if they have their familiar dishes and bowls. He’ll need his favorite toys and cat bed, too, and don’t forget his medical records. Soda's family couldn't afford a cat. Okay, so you’ve already ruled out taking your cat to a kill shelter. Thank goodness that option’s off the table. But don’t assume a no-kill shelter will be able to come to your rescue, at least not right away. The only way no-kill shelters can make room for new cats is through adoptions. And shelter life can be very hard on cats who have always lived in the same home and older cats. 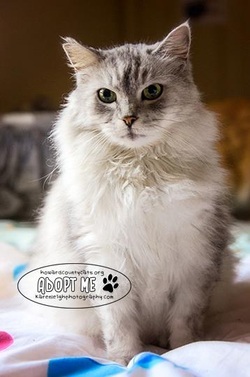 Your cat will be much happier and much more adoptable if he can stay with you until his new family comes along. Before rehoming your cat, make an honest effort to find a way to keep him with you. With help and some research, there are solutions to behavior problems and even allergies. It’s also possible to find cat-friendly housing if you must move, even if you have to negotiate an agreement with your new landlord. 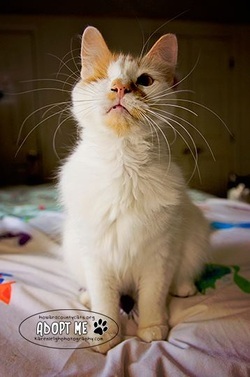 Cats are not like an old pair of shoes that can be discarded when they no longer fit. Your cat is part of your family, and he deserves the same kindness and respect as any other family member, even if that requires some compromise on your part and his.